Burton Road Chippy and The Elite Fish and Chip Company celebrated success at the awards ceremony. Two popular fish and chips businesses from Lincolnshire are celebrating success after netting top national industry awards. 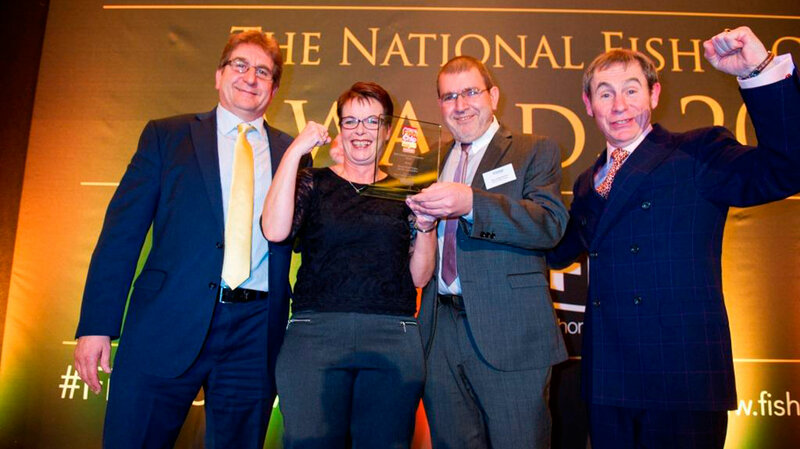 The 2015 National Fish & Chip Awards took place at the Lancaster London Hotel on January 20 and saw fish and chip shops from around the country gather for the 27th year to celebrate top performances. Lincoln fish and chip shop and restaurant Burton Road Chippy scooped two awards at the ceremony. The business was crowned Independent Fish and Chip Restaurant of the Year, as well as receiving an award for Staff Training and Development. Burton Road Chippy co-owners Lesley Graves and Des Anastasiou (middle) celebrating a double win with awards host BBC Radio 2’s Nigel Barden and awards sponsor Philip Blakeman, Managing Director of James T Blakeman & Co Ltd.
Des Anastasiou, co-owner of Burton Road Chippy, said: “We’ve worked so hard over the last 12 years to build a successful business. It’s just amazing to receive recognition and be rewarded for our efforts. “Staff training is something we take very seriously, all our employees receive both external and in-house training as part of our programme. We believe the better the training, the better the business. The award for Young Fish Fryer of the Year went to Rachel Tweedle, 25, who manages The Seaford Elite Fish and Chip Company restaurant and takeaway. The business, which also has restaurants in Lincoln and Ruskington, put Rachel to the test against other young fryers at the National Federation of Fish Fryers (NFFF) Training School in Leeds. She was reviewed for chip preparation and frying techniques, as well as a personal skills test. Rachel said: “After reaching the final six of the nation’s top young friers it’s great to win the award and be named Young Fish Frier of the Year. “I’m looking forward to promoting the competition to young people within our sector and encouraging more people to consider our industry as a career path. It’s been a great opportunity to learn new skills, meet new people and expand my career.